Egypt's Zamalek will be keen to make up for a stunning opening defeat in the African Confederation Cup group stage when they host Algeria's NA Hussein Dey on Wednesday. 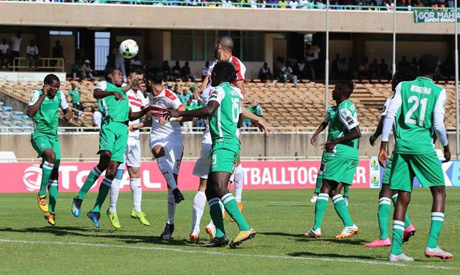 Zamalek produced a disastrous defensive display to suffer a 4-2 defeat at Kenya's Gor Mahia in their opening Group D match early this month. The White Knights' Swiss coach Christian Gross said the team's defensive blunders were to blame for the reverse and he is fully aware they cannot afford to make similar mistakes against NA Hussein Dey. The Algerians kicked off the group stage with a 2-1 home win over Angola's Petro Atletico and they are unlikely to be easy prey against Zamalek, who are buoyed by a superb run of form in the Egyptian Premier League which saw them win 10 out of their last 11 matches to top the table. "We need to score two goals and win to make up for the loss against Gor Mahia. Tomorrow's opponents are strong and they have an experienced coach, but we will fight to win," Gross told the pre-match news conference. "I spoke with the players about our defensive problems and we worked on improving that aspect of our game." Zamalek welcome back Tunisian right-back Hamdi Nagguez after he missed the 1-0 league win over Nogoom due to a slight injury. Veteran playmaker Ayman Hefni, the hero of the team's 2015 Egyptian league triumph, is also included in the squad after coming off the bench to score the winner against Nogoom on only his second league appearance of the season.